The head of Russian oil company Rosneft, Igor Sechin, traveled to Venezuela this week for meetings with socialist dictator Nicolás Maduro to complain about delayed oil shipments designed to repay loans, Reuters reported Sunday. Sechin and a large delegation of his executives met with officials from Petroleum of Venezuela (PDSVA) this week, as well as Maduro himself, with Sechin allegedly rebuking him for a number of oil shipments that have not been delivered or are behind schedule. 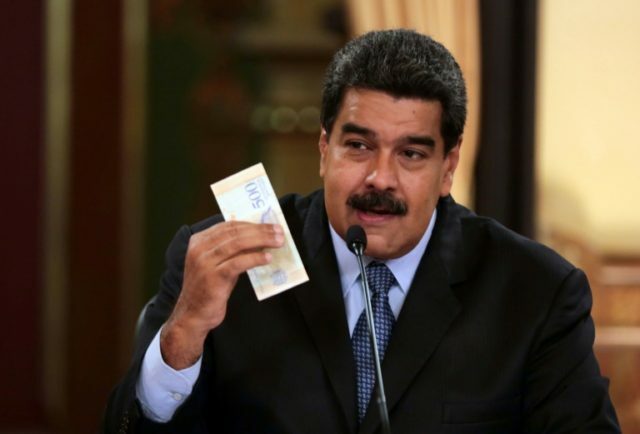 Over the past decade, Moscow has become one of the most steadfast backers of the Maduro regime, providing least $17 billion in loans and credit lines since 2006, as well as significant arms deals and military intelligence. In return, Moscow has demanded repayment in the form of oil shipments, although the regime is finding increasingly difficult to meet its obligations due to the ongoing collapse of the country’s state oil industry. The visit is the first possible sign of strain in the two countries relationship after Russian President Vladimir Putin offered Maduro a generous debt restructuring deal last November. Despite receiving more payments than Russia, China has also expressed frustration at the regime’s inability to make its oil payments, having loaned approximately $50 billion to the regime in return for oil. In June, Beijing reportedly threatened to cut off all loans to the regime until payments were made, but following a meeting between Maduro and Xi Jinping in September, the former said that Xi had agreed to provide further funding in return for one million barrels of oil. This month, international oil experts warned that Venezuela’s production is in total “free fall” and could soon fall as low as under one million barrels per day, meaning production is now at a 30-year-low. When leftist dictator Hugo Chávez came to power in 1998, the country was producing approximately 3.2 million barrels a day while also benefitting from high global oil prices. A collapse in production and overall mismanagement of the PDSVA has therefore played a central role in the collapse of the country’s economy, with oil representing around 90 percent of Venezuela’s total export markets.